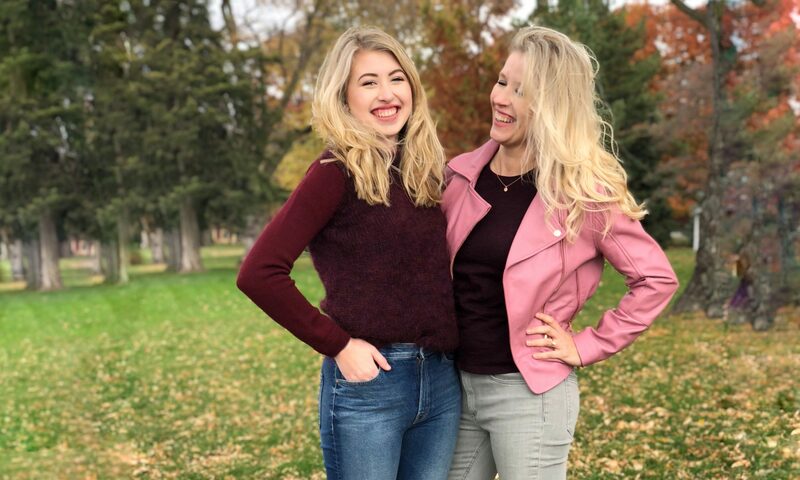 Model Emily Pillard of Em’s Trends and her mom, Marion. Footwear from Pattino Shoe Boutique. Vince Sweater, Rag & Bone Jeans, Melinda Maria Jewelry. On Emily (left): Part Two Sweatshirt, Bitte Kai Rand Pants. On Marion (right): Sunspel Sweater and Pants, Tilo Scarf. Veda Jacket, Elie Tahari Dress, Melinda Maria Jewelry. On Emily (left): Vince Coat, Derek Lam Dress. On Marion (right): Mijeong Park Coat, Kal Rieman Shirt, Veda Leggings. Kal Rieman Shirt, Veda Leggings, Melinda Maria Jewelry. Mijeong Park Coat, Kal Rieman Shirt, Veda Leggings. On Emily (left): Mih Jeans Sweater, Mother Denim. On Marion (right): Ted Baker Jacket, ATM Tee Shirt, Rag & Bone Jeans, Piedras Designs Jewelry. On Marion (left): Kal Rieman Suit, Bitte Kai Rand Top, Melinda Maria Earrings. On Emily (right): Vince Sweater, Melinda Maria Jewelry. Derek Lam Dress, Melinda Maria Jewelry. Derek Lam Sweater, Rag & Bone Jeans. Kal Rieman Suit, Bitte Kai Rand Top, Melinda Maria Earrings. Mih Jeans Sweater, Mother Denim, Trademark Bag, Stine Goya Scarf. Model Emily Pillard of Em’s Trends. Footwear from Pattino Shoe Boutique. Jewelry from Piedras Designs. Shot in Remodeled Home by Carlson Projects. Cupcakes & Cashmere Vegan Leather Moto, Rag & Bone Knit Dress. Steven Alan Sunglasses, Derek Lam 10 Crosby Jacket, Ganni Tee and Bag, Part Two Pants. Ganni Tee, Part Two Pants. Part Two Lace Top, M.i.h Jeans. Rag & Bone Knit Dress. Photography by Chloe DeCoito. Models Holly Hanau and Caro McDermott. Makeup by Chloe DeCoito. Hair by Beth Woodman of Fresh Salon. Footwear from Pattino Shoe Boutique. (L) M.i.h. embroidered dress, Ted Baker Bag and Elizabeth & James jewelry. (R) Tibi wool sweater, DVF pants and Lizzie Fortunato earrings. (L) M.i.h. embroidered dress, Ted Baker Bag and Elizabeth & James jewelry. (R) Tibi wool sweater, DVF pants and Lizzie Fortunato earrings. Mijeong Park puffer, Vince boatneck tunic, ecru leather leggings, Piedras Designs necklace. M.i.h. embroidered dress, Elizabeth & James jewelry. (L) M.i.h. embroidered dress and Elizabeth & James jewelry. (R) Tibi wool sweater and Lizzie Fortunato earrings. (L) M.i.h. embroidered dress, Ted Baker Bag and Elizabeth & James jewelry. (R) Tibi wool sweater, DVF pants and Lizzie Fortunato earrings. (L) Mijeong Park puffer, Vince boatneck tunic, ecru leather leggings, Piedras Designs necklace. (R) Mijeong Park handmade coat, Maison Père sweater, Frame denim, Lizzie Fortunato earrings. (L) M.i.h. embroidered dress and Elizabeth & James jewelry. (R) Tibi wool sweater, DVF pants and Lizzie Fortunato earrings. Ganni leather wrap jacket, Derek Lam 10 Crosby shirt, Rag & Bone jeans. Mijeong Park handmade coat, Maison Père sweater, Frame denim, Lizzie Fortunato earrings. Derek Lam 10 Crosby shirt, Rag & Bone jeans, Lizzie Fortunato and Elizabeth & James jewelry. Photography by Suit & Tie Films. Model Alyssa Weber. Makeup by Amanda Lee Artistry. 100% real flower wall by Petals to Platinum. Footwear from Pattino Shoe Boutique. Bitte Kai Rand knit dress. Veda suede jacket. Elie Tahari organza jacket. Vince silk shell. Frame jeans. Vince silk blouse. Piedras Designs necklace. Tibi one-should top. Ted Baker clutch. Tibi black pants. Tibi beaded blouse. Elizabeth & James jewelry. Tibi beaded blouse. Elizabeth & James jewelry. Parker Smith jeans. DVF dress. Elizabeth & James earrings. Bitte Kai Rand knit dress. Elizabeth & James earrings. DVF jumpsuit. Elizabeth & James earrings. DVF dress. Elizabeth & James earrings. Derek Lam handbag. Elie Tahari organza jacket. Vince silk shell. Vince silk blouse. Piedras Designs necklace. 3×1 jeans. Tibi one-shoulder top. Tibi black side-snap pants. Tibi one-shoulder top. Piedras Designs necklace. Bitte Kai Rand knit dress. Photography by Suit & Tie Films. Model Lauren Bejot. Makeup by Amanda Lee Artistry. Hair by Beth Woodman of Fresh Salon. Footwear from Pattino Shoe Boutique. Ted Baker hat. ATM dress. OMC pouch. Piedras Designs jewelry. Achro cardigan. Ted Baker top. Frame jeans. Ted Baker handbag. Ganni sheath dress. Ganni overcoat. Ted Baker hat. Achro cardigan. Tibi knit tie-sleeve top. Veda leather dress. Tibi pom-pom sweater. Vince jeans. Ted Baker handbag. Tilo scarf. OMC pouch. Equipment tunic. Frame jeans. Ted Baker hat. ATM dress. OMC pouch. Piedras Designs jewelry. Veda suede jacket. Quinn cashmere sweater. Veda corduroy pants. Ted Baker handbag. Tilo scarf. Equipment silk tunic. Frame jeans. Ted Baker top. Elyona necklace. Ted Baker handbag.